At Zohar Law PLLC, we provide you with immigration information that will be helpful to coming to America, staying here, or bringing loved ones over. One of the many visas we can help you apply for is the O-1 visa. 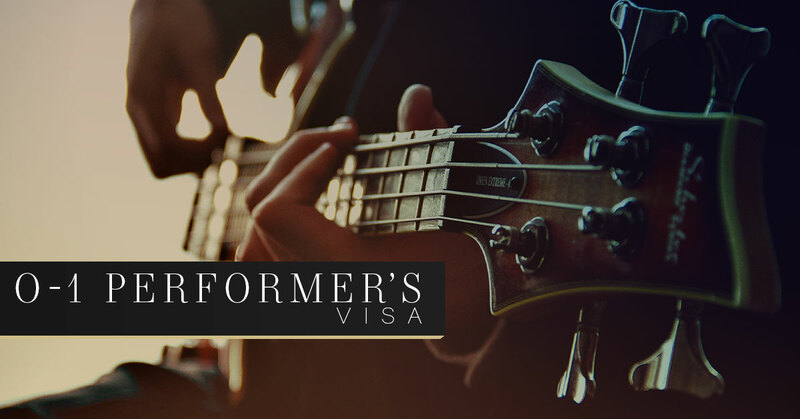 This visa is for performers and is a nonimmigration visa. If you’re interested in applying for this type of visa, then take the time to contact an immigration lawyer for assistance. For a full list of our immigration services, click here. This type of is a nonimmigration visa. This means that it doesn’t allow a person to live in America, but to come here for a temporary amount of time. The O-1 visa is for a person who has extraordinary abilities in athletics, education, sciences, arts, business, or who has extraordinary talent in the motion picture or the television industry and have been recognized internationally or nationally for his or her talents. This visa is for a person who has demonstrated that they have achievements or abilities that are remarkable. In the O category of visas, there are many different types. There is the O-1A, O-1B, O-2, and O-3. O-1A: This category doesn’t include motion pictures, the television industry, or arts. It is specific for people who have extraordinary skills in education, athletics, business, or sciences. O-1B: This category is for those who specifically offer amazing talents in arts, motion pictures, or the television industry. O-2: This visa is for the person who will accompany someone who is an extraordinary artist or athlete, i.e. someone with an O-1 visa. For a person with the O-1A visa, the person who received the O-2 has to be an integral part of the activity of what the person with the O-1A visa does. For a person who has an O-1B, the person who is obtaining the O-2 visa has to be essential to the resolution of the O-1B’s production. The person who obtains the O-2 visa has to have skills that are critical and experience that is essential so that the O-1 visa receiver is unable to work without them or they are imperative to the success of the performance. O-3: This visa is for the partners and the children of the people applying for the O-1 and the O-2 visa. To become eligible for this visas there must be a beneficiary who can demonstrate that your ability is extraordinary and there is a sustained national or international acclaim. Additionally, entrance into the country must be a temporary one and you have to continue with in the specific area of your extraordinary ability. For example, if you’re an actor who enters the country to perform in a play you cannot decide that you want to fulfill your dreams of a movie instead. Furthermore, in the field of education, athletics, education, or sciences you need to meet a certain level of expertise that has risen to the small percentage of those who have risen to the top of the field. If you’re an acclaimed expert in your field or you’re an artist who has achieved international or national success, then you can rely on our law firm to help you obtain an O-1 visa as well as one for your loved ones and assistant. Fill out the form below to schedule an appointment with an immigration lawyer.